I have no idea what it is with this Taiwanese company but their shacks have the longest names of any snack I’ve reviewed in the eight years of the JSFR. 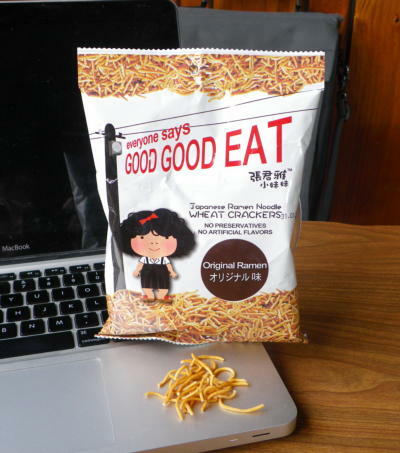 On the other hand, I think I appreciate a 14 word title over “squid snacks” or “chocolate candies” because nobody is going to confuse Wei Lih Japanese Ramen Noodle Wheat Crackers (original ramen) with anything else I review. Ever. These are also the last of the Wei Lih snacks of loquaciousness I have on hand so there will be some respite from the many worded titles. Also also, these wheat noodle crackers are some of the last snacks from The Great Snack Excursion of Ought Eleven so that too will be winding down. On the other hand, I may have recently made a trip out to My Favorite Asian Grocer Store so there is really no end in sight of my snack stash. Wei Lih snacks! I has them. Sadly, there is not much more to say that I haven’t already said about Wei Lih snacks. The past few have been likened to chow mein noodles and Original Ramen are even more like chow mein noodles than their predecessors. They are noticeably smaller in diameter than your typical chow mein noodle but every bit as long. They also have that chow mein noodle crispity and slightly deep fried wheaty taste. The only solid difference is that Wei Lih puts quite a bit of salty soy flavor in their snacks. They have a rich dark salted soy sauce deliciousness plus MSG as well. Salty goodness. My personal tastes run a little less salty which means these ought to be spot on terrific for most everyone else. Even my mom, who loves her salt, would be happily satisfied munching on these. I bet they would be fantastic with beer…I’m going to have to try that out.